Home / Events / What Use is a Digital Edition? What Use is a Digital Edition? We are pleased to have Dr. Li with us at the Dept. of Asian Studies as a Postdoctoral Research Fellow working with the UBC Sanskrit Program in developing a comprehensive tool for digitally editing, analyzing, and presenting Sanskrit manuscripts. In this presentation, he will offer insights into his scholarly research in Buddhist Studies as well as a more informal demonstration/workshop on current developments and issues in digital approaches to premodern textualities. Faculty and especially students from all disciplines and areas of focus are invited to attend as Dr. Li’s work engages with multilingual and multidisciplinary materials. 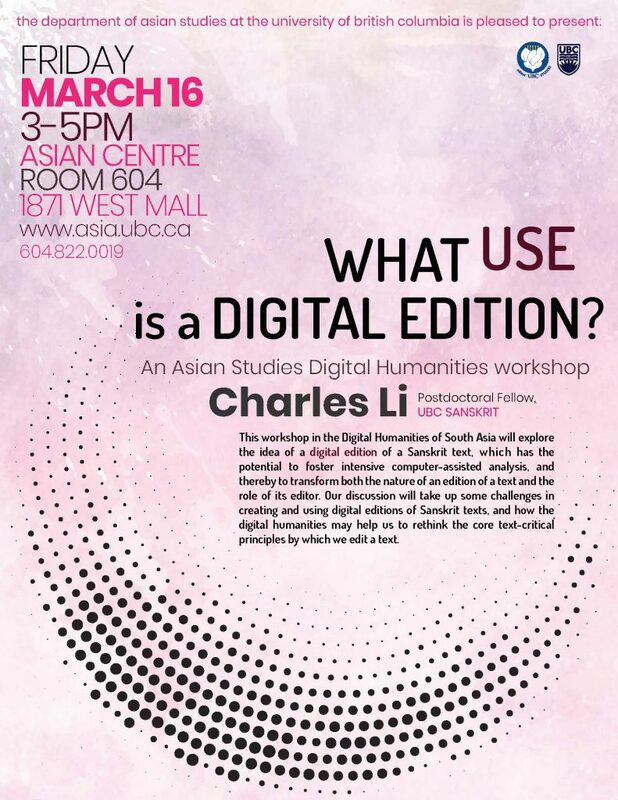 Charles Li (Ph.D. 2018, Cambridge University) is a specialist in Sanskrit grammar and literature, Indian Philosophy, Buddhist Studies, and South Asian Digital Humanities. This event is second in a 2 part series of talks with Charles Li. View the first event, Reconstructing Ananda’s Grief in the Mahaparinirvana Sutra, on March 14th.